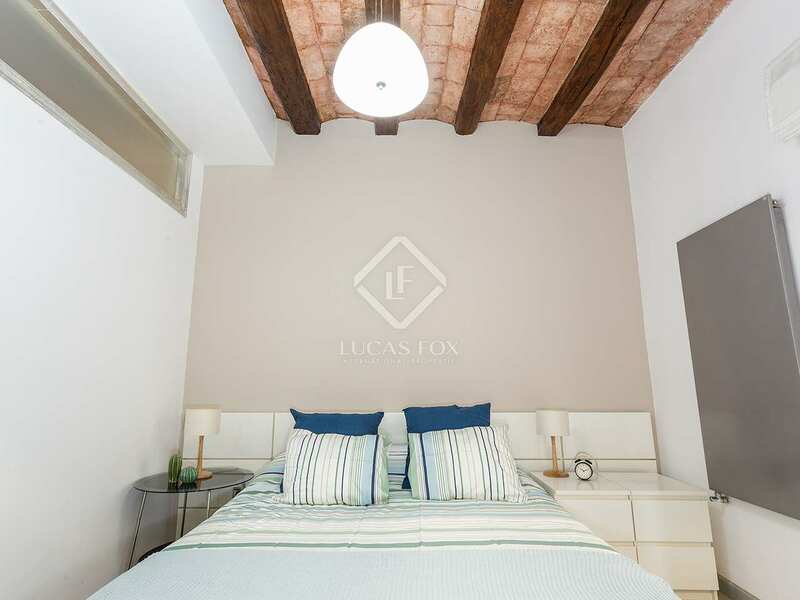 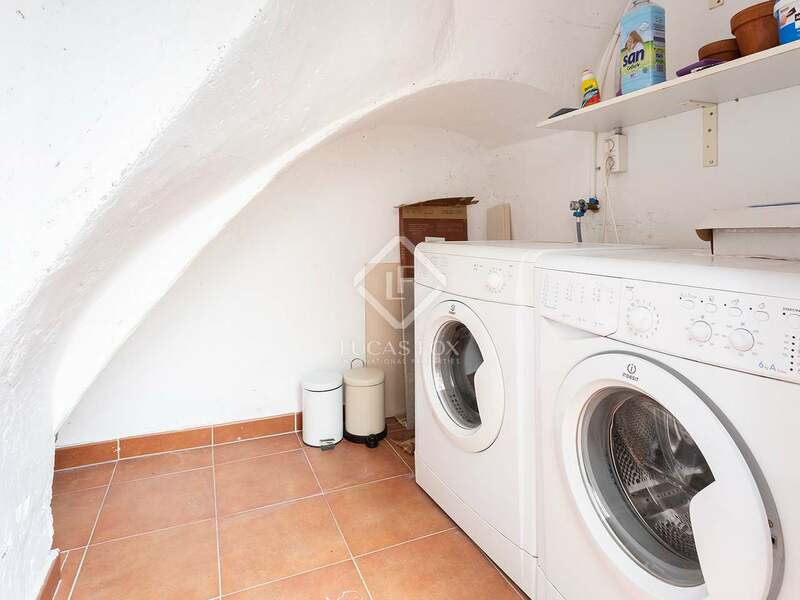 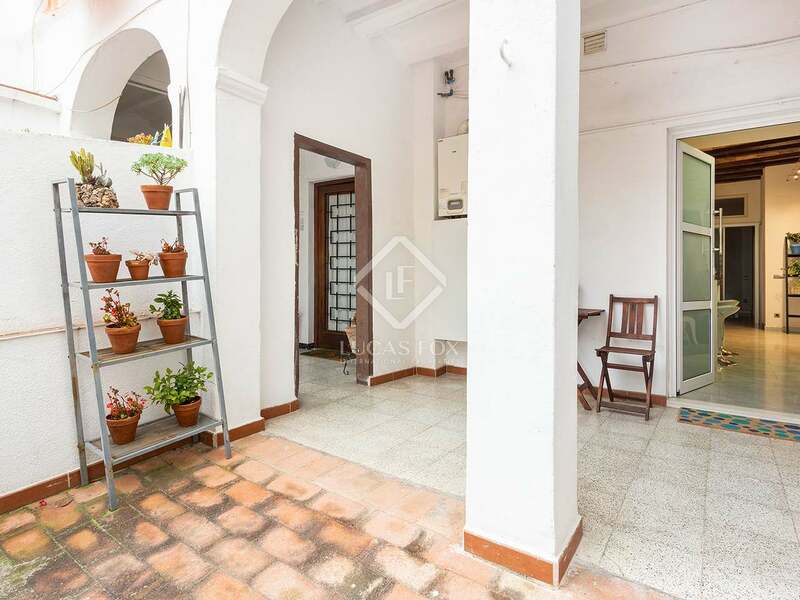 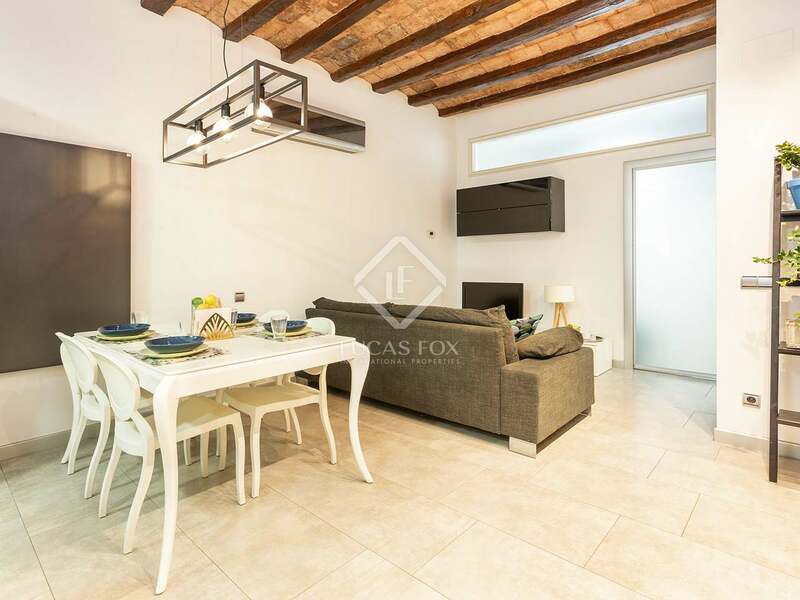 Charming 1-bedroom apartment with an Andalusian patio for sale in Vila de Gràcia. 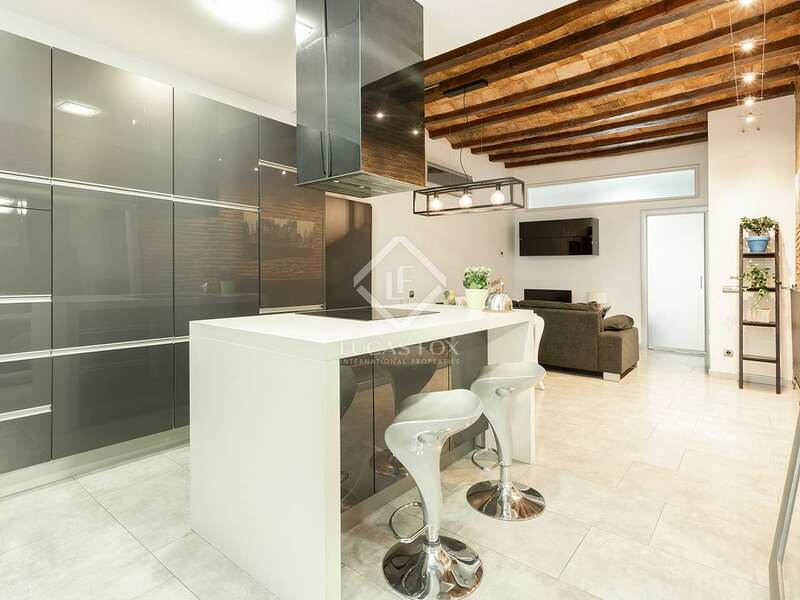 This fantastic property has been renovated using high quality materials and finishes whilst preserving original features such as the high ceilings with wooden beams. 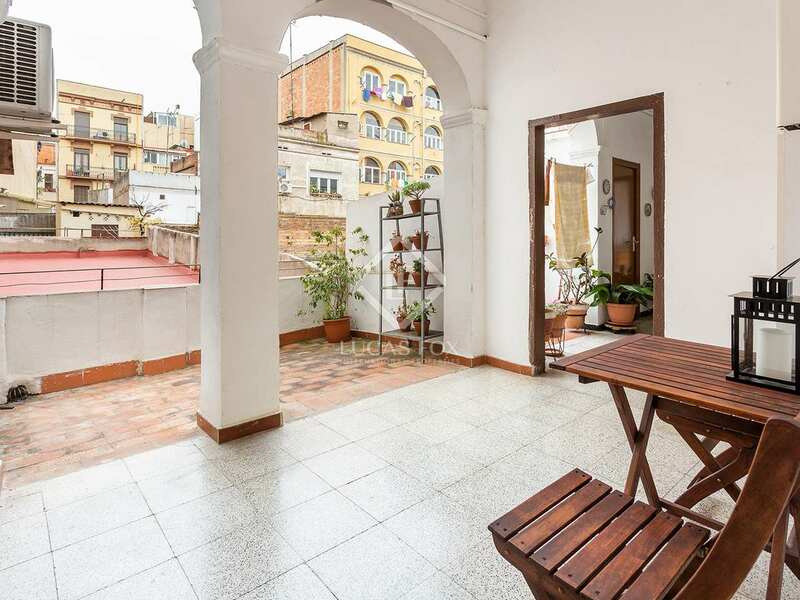 The charming Andalusian patio, a style of terrace rarely found in Barcelona, is a unique feature. 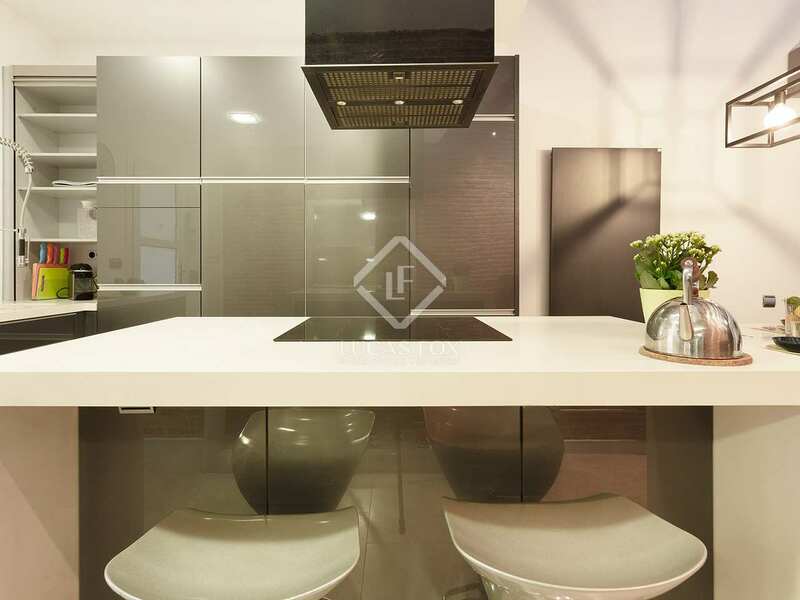 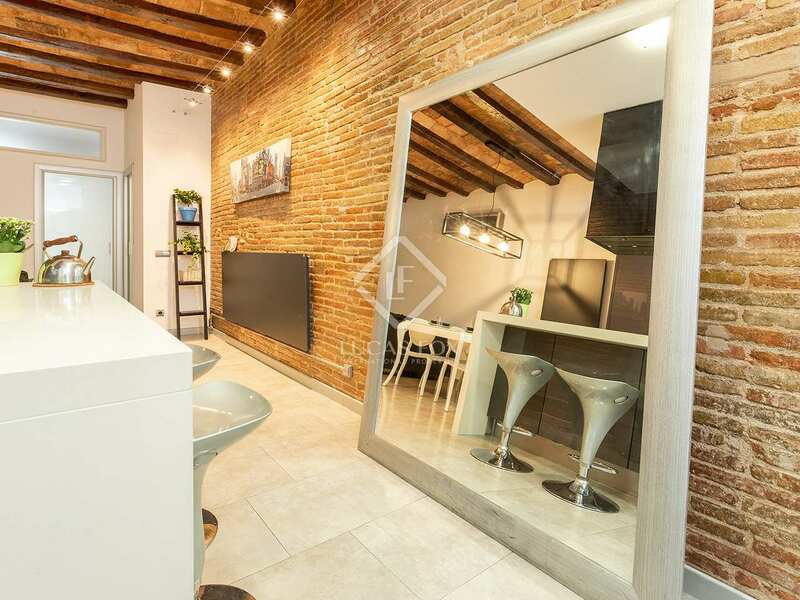 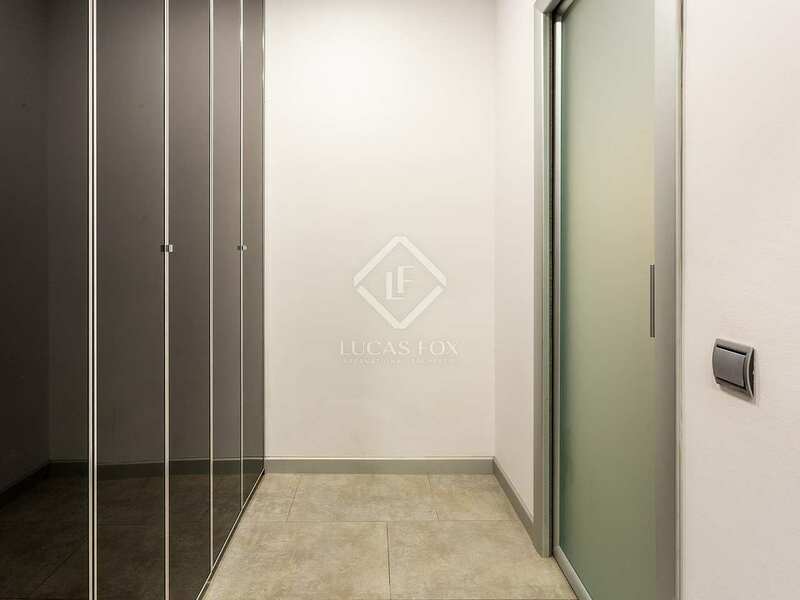 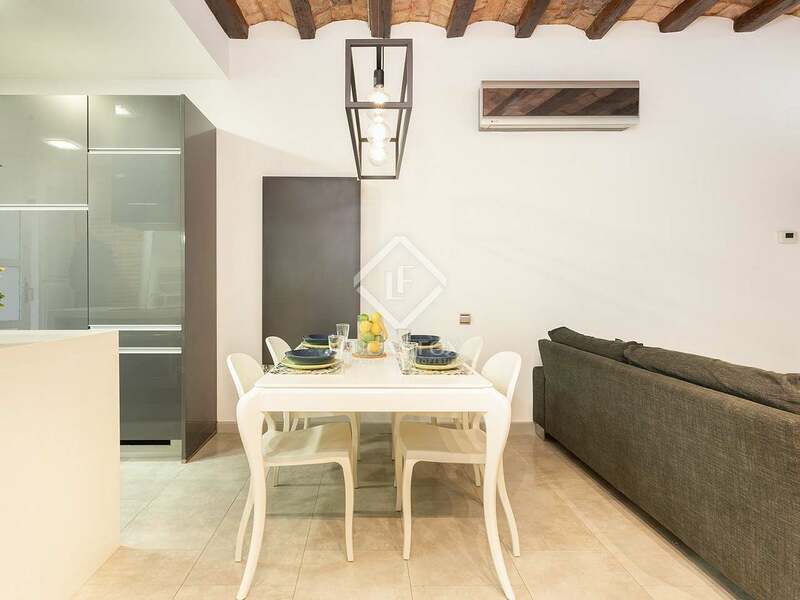 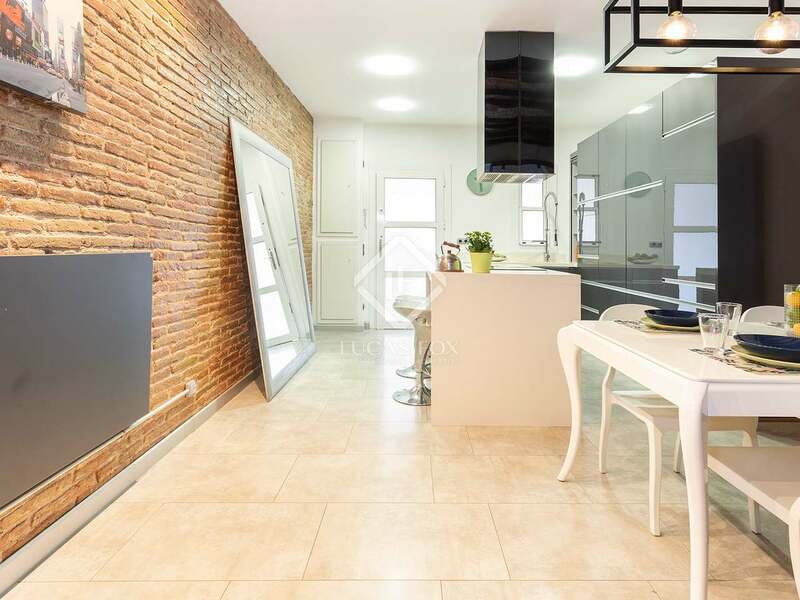 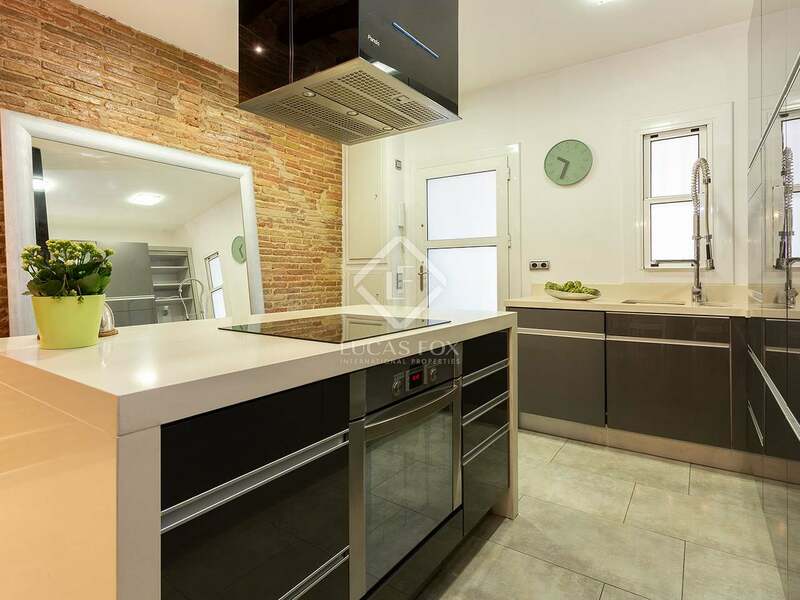 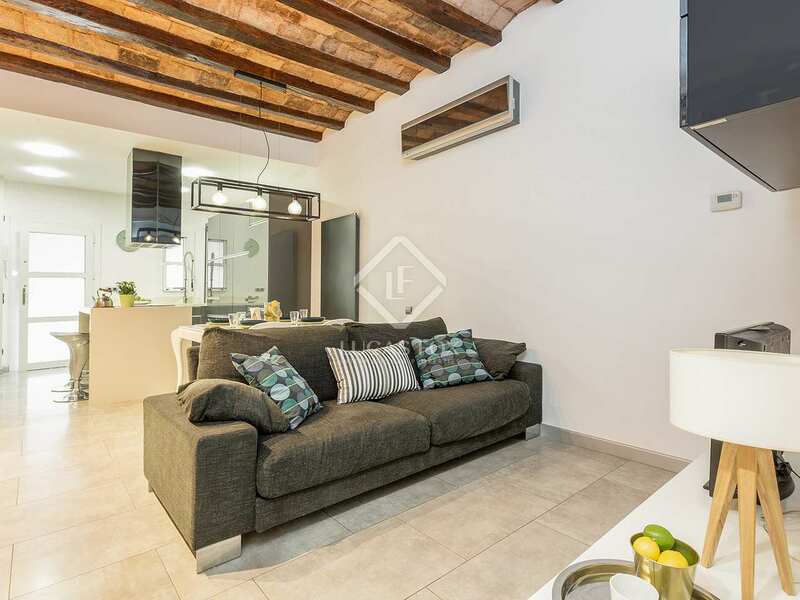 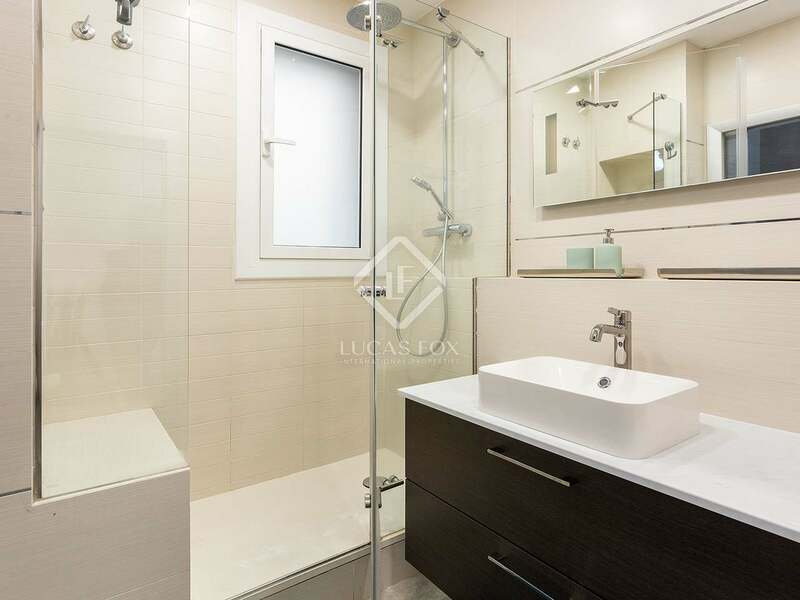 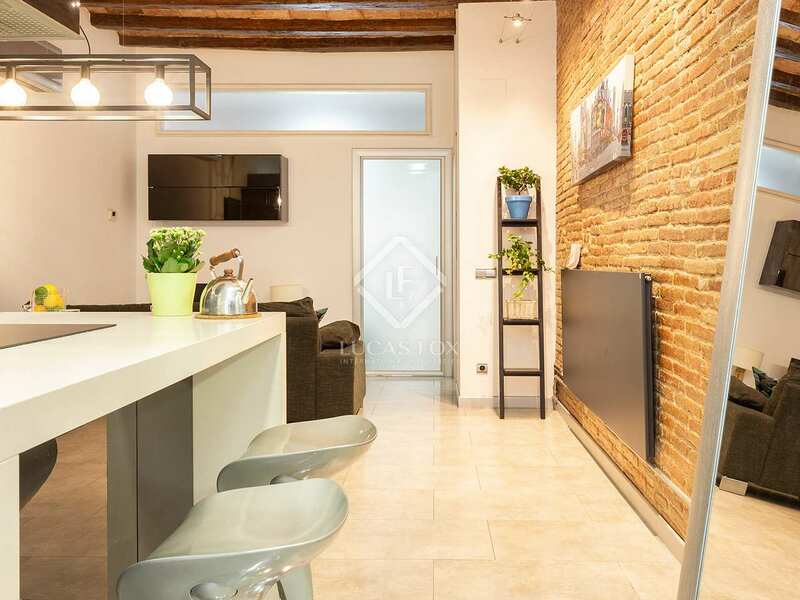 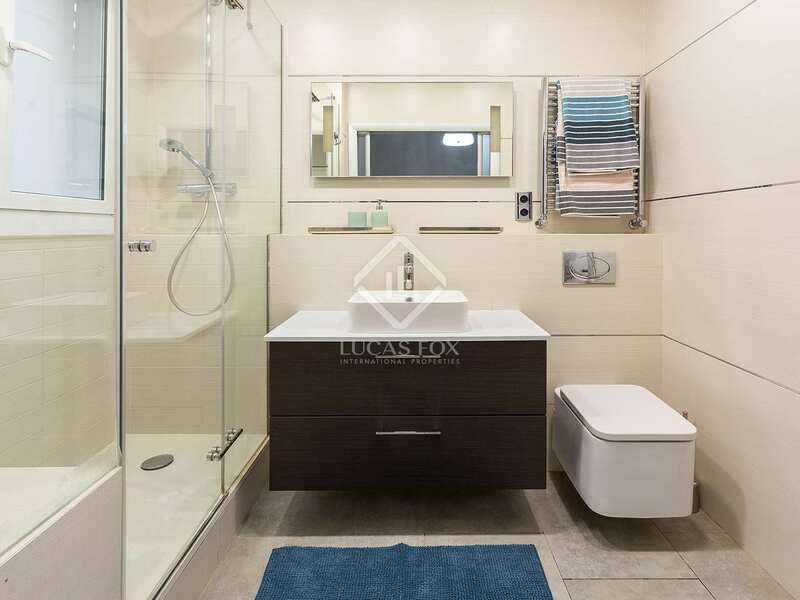 All this, added to its setting on a quiet, pedestrianised street in Vila de Gràcia, make this a home with great personality, ideal for an individual, couple or even as an investment. 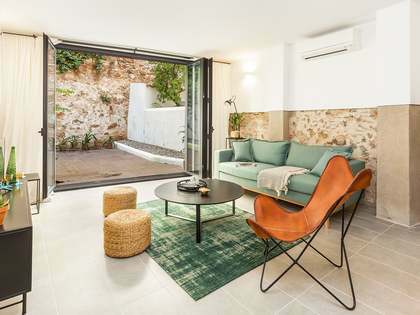 The apartment is accessed via the semi-covered terrace; the ideal space for a table and chairs from which you can enjoy the peace and quiet after a long day or breakfast on a sunny weekend. 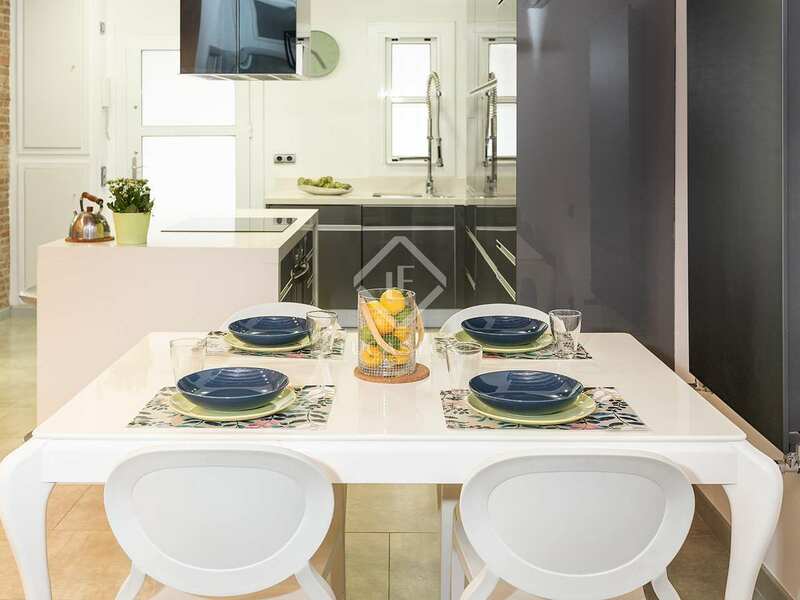 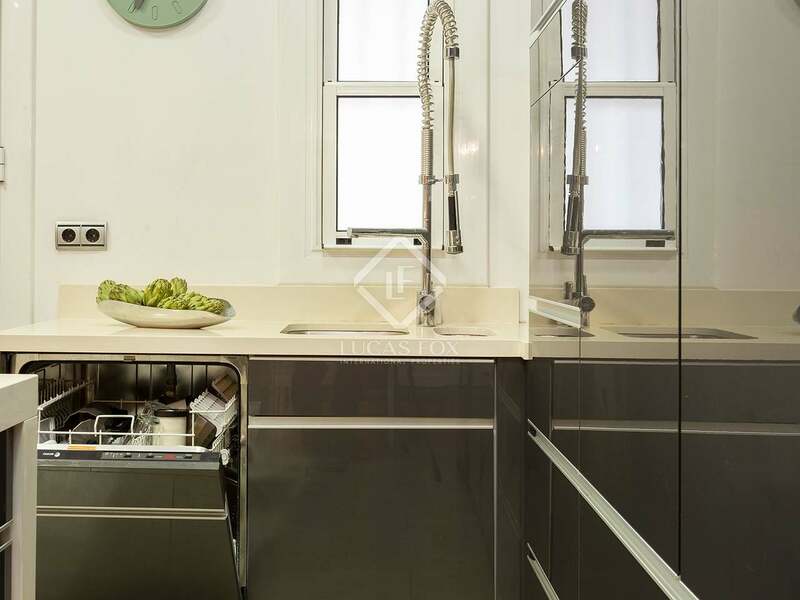 We enter directly into the kitchen which is renovated and equipped and has a central island with a breakfast bar. 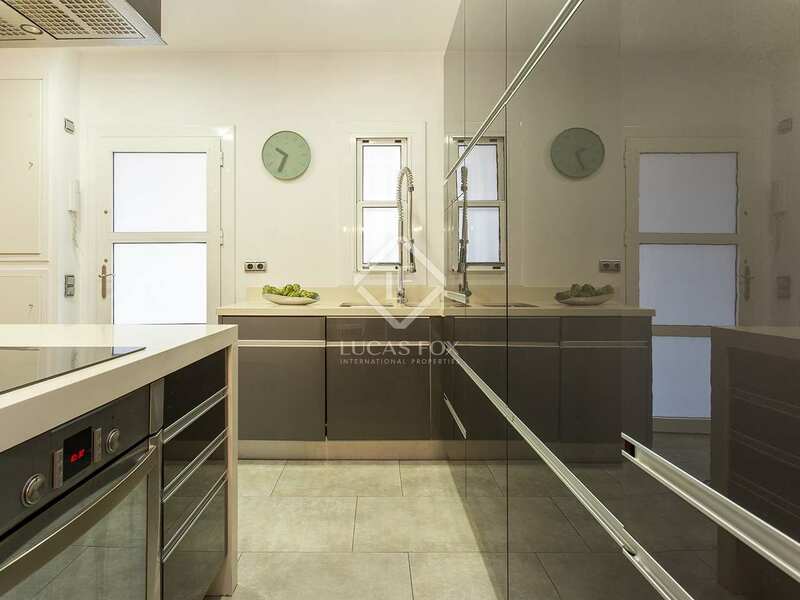 The kitchen leads through to the living-dining room. 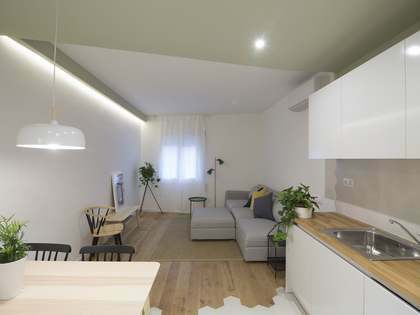 This room is designed with dark grey tones, in attractive contrast to the rest of the space and furniture. 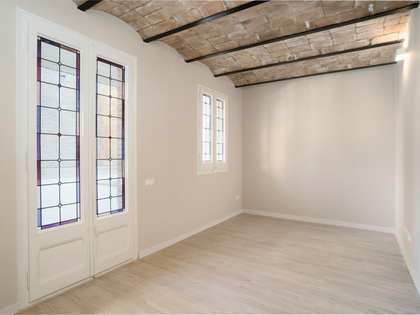 This sophisticated living area is both comfortable and spacious, an exposed brick wall adds character. 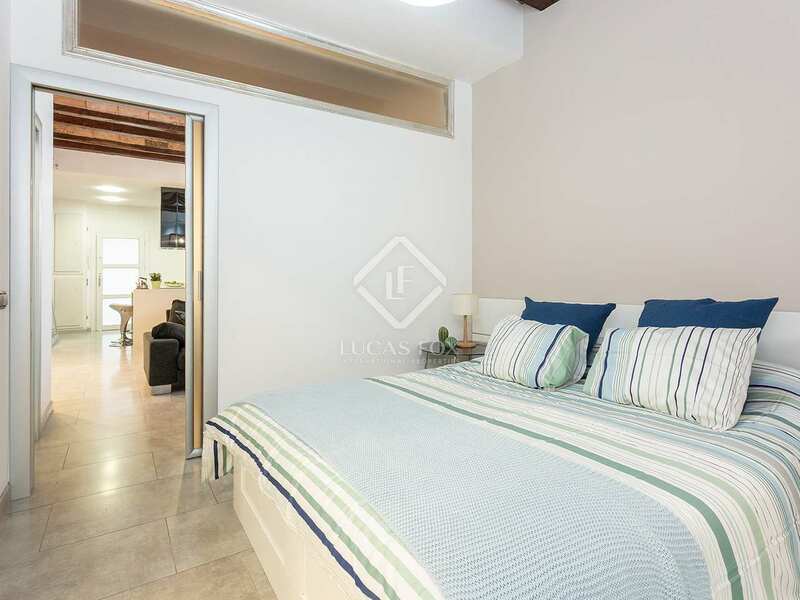 The living room is connected to the generously sized bedroom with a private bathroom with a shower and a dressing room. 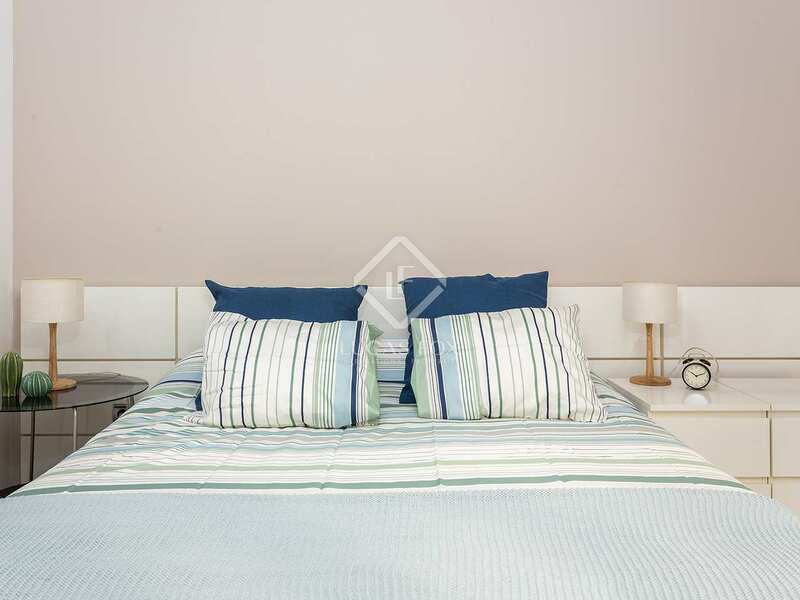 Although the apartment currently has one bedroom, its layout means it would be possible to add a single bedroom if desired. 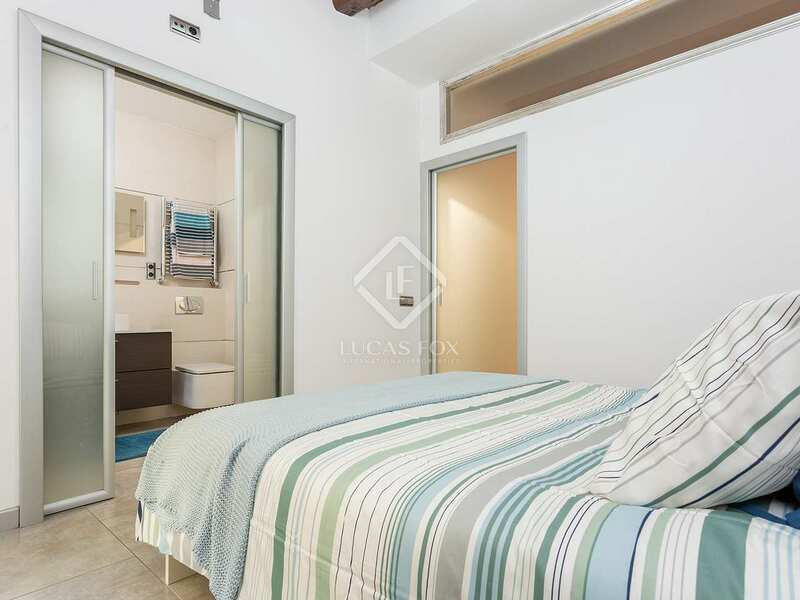 The apartment has air conditioning and heating to ensure comfort throughout the year. 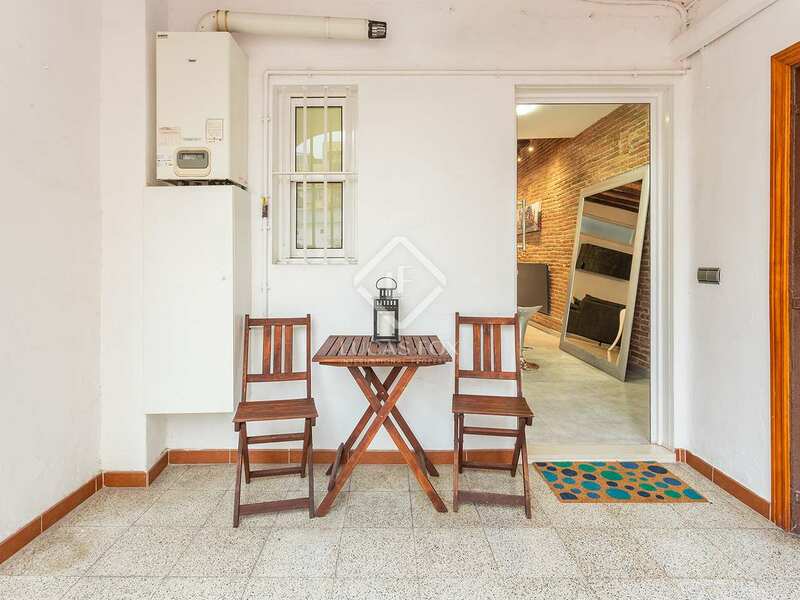 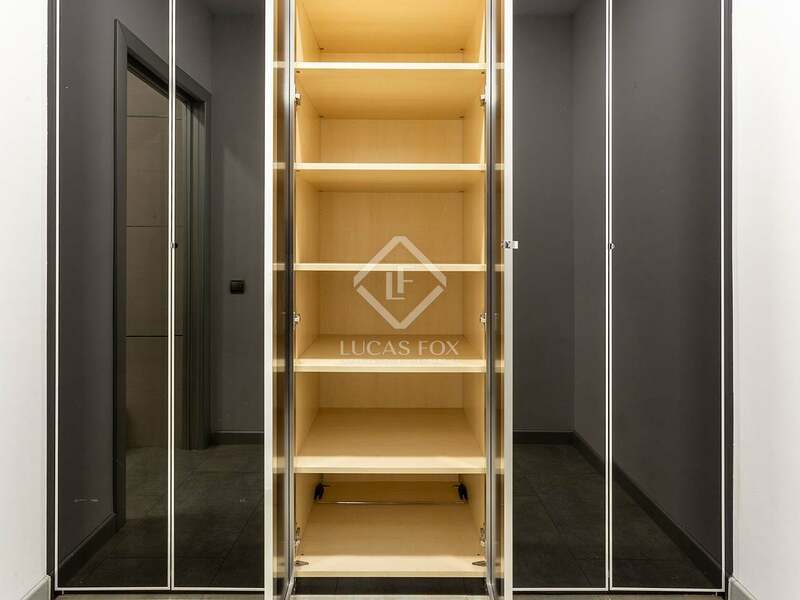 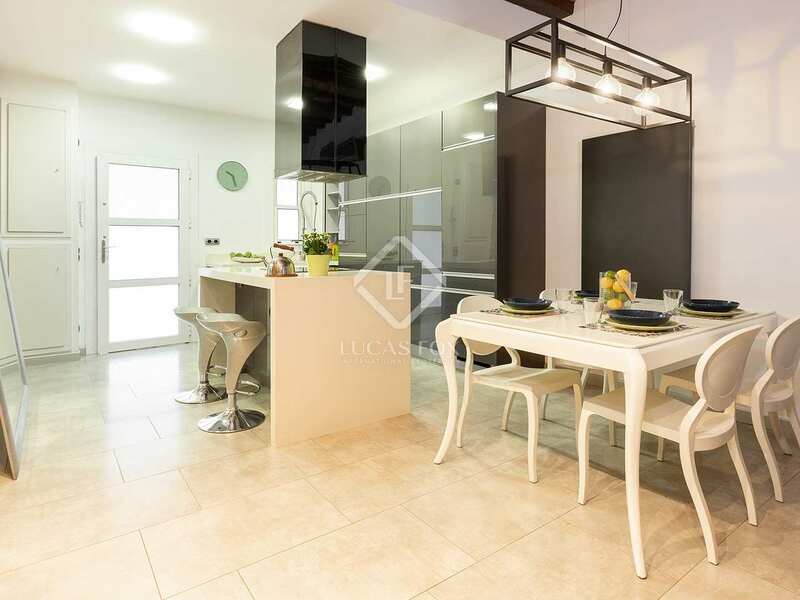 Contact us to visit this wonderful apartment with a terrace for sale in Vila de Gràcia. 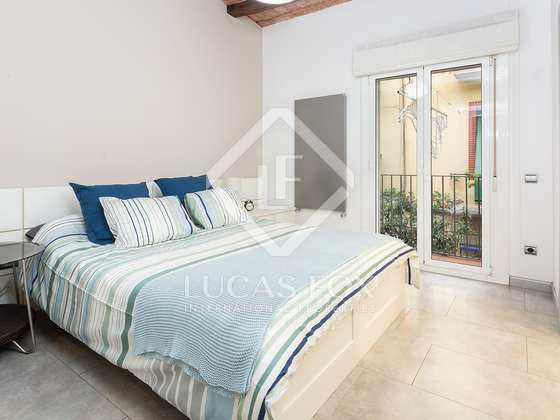 Property located in an excellent area, in the lower part of Vila de Gràcia, between Torrent de l'Olla and Gran de Gràcia, near the Plaça de la Vila and the Central Abacería market. 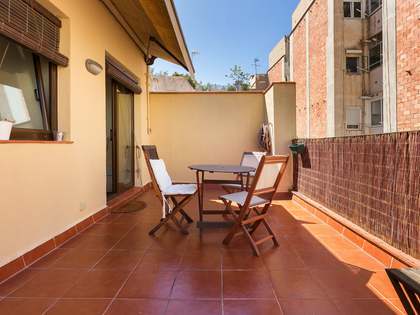 Vila de Gràcia has great personality, with its low buildings and narrow streets. 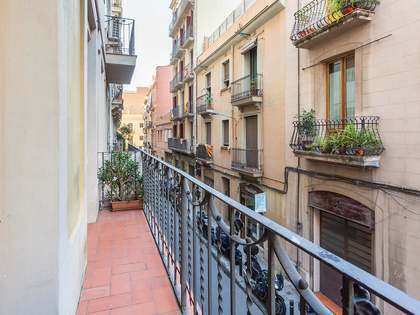 This neighbourhood has many shops, both modern and traditional, excellent restaurants and bars with all kinds of cuisine on offer and beautiful squares full of terraces, ideal for an aperitif whilst enjoying the privileged Mediterranean climate. 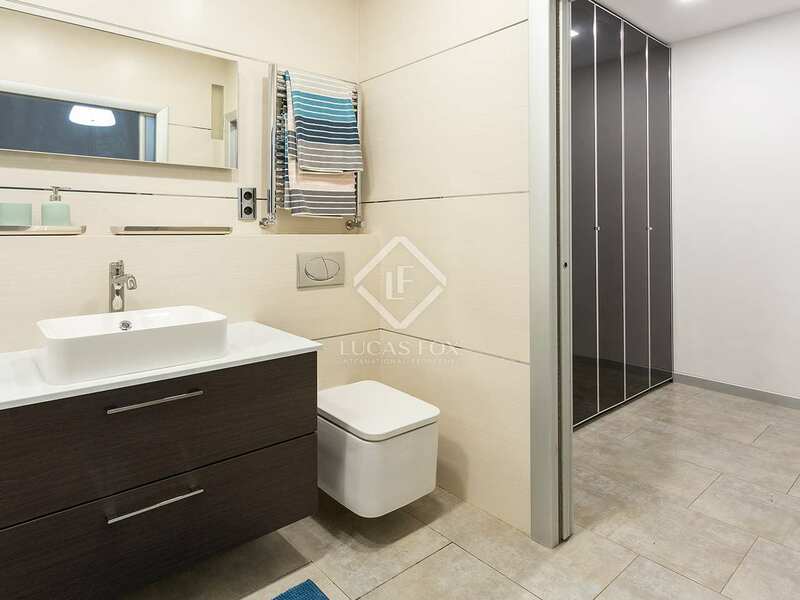 The area includes all everyday services and is well connected to public transport networks.